Retro style brings flair and personality to your outfits, be it for casual brunches, drinks or full-on date nights. (That is, when I’m not dressing for comfort in minimalist, muted pieces). But don’t expect me to recommend full-fledged bell bottoms around town. This little assortment is more about subtle 60s and 70s inspired details, such as retro lapels, juxtaposed patterns and colors, an abundance of washed denims, to name a few. In these chilly days, a high-neck ribbed top may be my go-to look, but there are plenty of girlie dresses and retro-inspired ensembles in my arsenal too. A collared button-down dress like this floaty edition takes you back to the 80s. Having said that, this design never really goes out of style, perhaps partly because of the use of bright colors. This lovely tea dress would go very nicely with coordinated accessories like a boxy green bag and heels. A two-tone flared dress, like this flirty navy number finished with a bow collar, is an effortless way to pull off the Jackie O in everyone. I’d play up the retro vibe with a floral headband and heeled Mary Janes. A worn-out denim jacket is a timeless and versatile topper that brings a nostalgic mood. Denim-on-denim (i.e. pairing denim jackets with jeans) has been tried and raved about recently. A good utilitarian jean jacket also looks great with flirty dresses and tones down the dressiness perfectly for casual outings. It feels like the good old days wearing a comfy ribbed crop top. I’d counter the fitted silhouette with high-waist, slightly flared jeans. Celebrities, street stylers and fashion bloggers alike have been remixing the timeless, long-loved print that is gingham. This slightly flared shirtdress not only makes for an ideal cool-weather staple, but also provides a fail-safe way to get vintage vibe for the high street. Delicate and flirty are two important characteristics of retro fashion. This houndstooth-print wrap dress flatters just about every body shape, thanks to the classic fit-and-flare cut. I’d style it with neutral wedges and a headband for the weekend. The ultimate in warmth and versatility, capes say that outerwear doesn’t have to follow all the key trends. At times I prefer a throwback topper over a midi dress. Just make sure to keep things slim for the bottom half to show off the silhouette. Round glasses are especially fantastic for complementing retro outfits. This rather unembellished pair is great for completing boho chic outfits, or you can wear them with a shirt and high-waist jeans for a more subdued look. Regardless of the outfit of the day, this monochrome, bow-accent headband injects just about any look with a nostalgic feel. Not-so-subtle floppy sunhats have a major retro vibe in them. 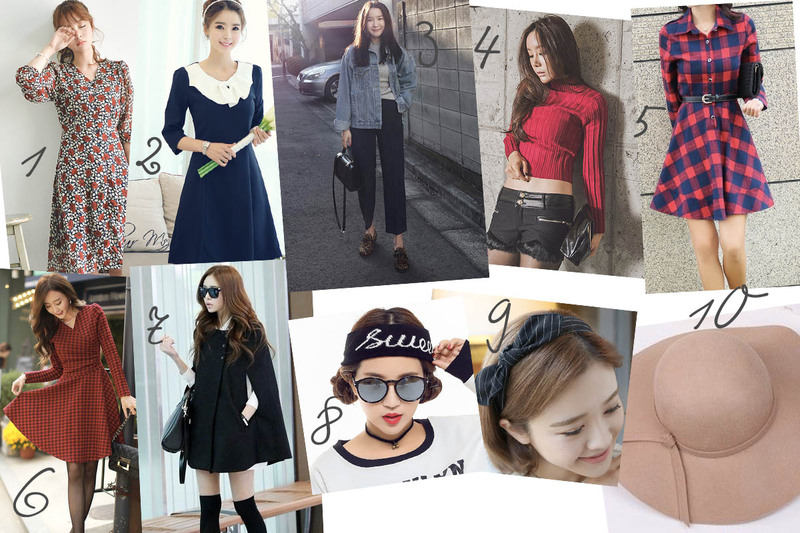 They are great with both colorful tea dresses and denim-on-denims, and of course with huge pairs of sunnies!